We made ours into personal mini-casseroles. It's St.Valentine's Day! A day when we're all suppose to show a little love. Everywhere you look - there is chocolate, candy and sugary invaders. Not that that's a bad thing but my Dan isn't really that into "sweets" so really any super powered chocolate heaven explosion would be more for me than for him and I think we've all dated that person. You know the one. The one who (perhaps innocently) enjoys your giving nature in a relationship a little too much and somewhere along the way the relationship becomes a one man or woman show. I think we should all agree this year that we shouldn't be those people or date them. Like a Valentine's Day Resolution. I mean Dan already took a week off work making me food and keeping you all updated with our culinary adventures. He took care of me when I was sick and even watched a lot of Star Trek. I mean a lot. Even after all that... there are still rumors of a present. GASP! I'm not sure what I did to deserve him. Maybe it is Karma from all those years of being vegan. Who knows? Let's not question it too much. 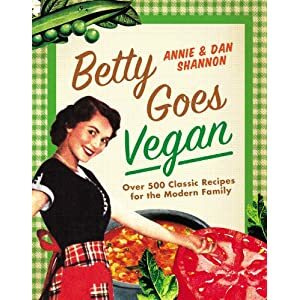 After Dan's crazy week in the kitchen I think he deserves a vegan vamped up version of Betty's Cheesy Pizza Casserole. Don't you? A clever combination of baked rigatoni, pizza flavors and mock meat... I know what my man likes. Prepare Paste per instructions on the box. In your treasured cast iron skillet, heat Olive Oil on a medium heat. If you are using Tofurky or Feild Roast Sausages, slice them into coins. Once the skillet begins to get warm, toss in your Italian Sausages. Brown your sausages until they have crispy edges. Remove from the skillet and set aside in a large mixing bowl. Then toss in your Vegan Pepperoni. Let brown until you get crispy edges. Then remove from your skillet and toss in the mixing bowl with your Vegan Sausages. Now add your Red Wine and Sliced Mushrooms to the skillet and cook. You may want to add another teaspoon of Olive Oil if you feel like all the Oil was used up in cooking the vegan meats. Frequently toss the Mushrooms in the skillet and cook them until they are tender. Then toss the cooked Mushrooms in with the cooked Vegan Meats. 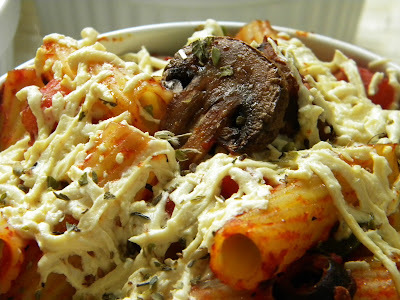 Add Green Bell Pepper and Black Olives to the mixing bowl with the Mushrooms and Vegan Meats and mix with a large spoon. In the same cherished cast iron skillet, add Garlic, Tomato Paste and Diced Tomatoes to the leftover Red Wine and Olive Oil. Stir and let heat until it begins to bubble. Then In the large mixing bowl, stir in Pasta and Sauce from the skillet. 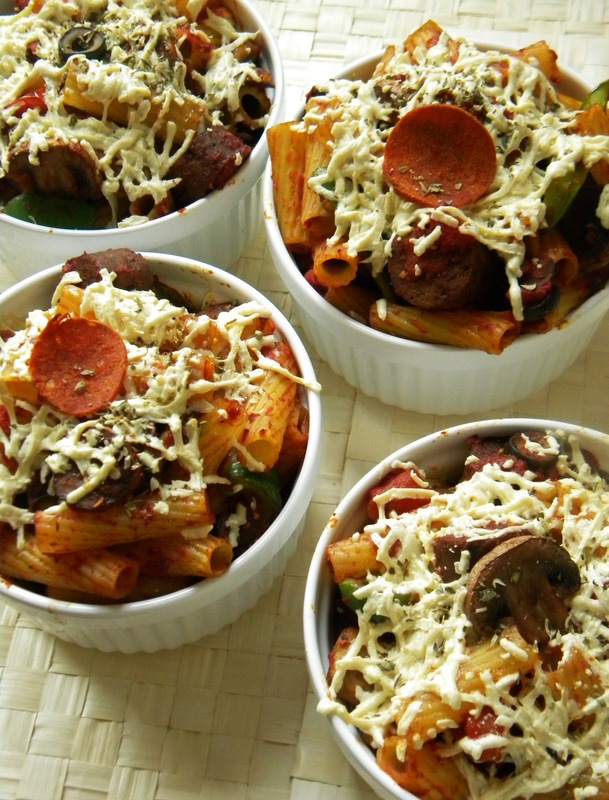 Then fill your mini casserole dishes or one large casserole dish with your Pasta and Toppings mix. Then sprinkle a good amount of Daiya Mozzarella on top. If you are like us and have some folks who say don't like Mushrooms, you can split up the toppings and try to make sure an keep those undesirables out. We marked ours with cute little Mushrooms on top. Once you have topped your casseroles with Daiya and marked which ones are which, bake them for 15 to 25 minutes. Pull them out once your Daiya is melted. Then top with Red Pepper Flakes or Vegan Parmesan Cheese or whatever you want. It's your party. And this one won't kill you!! Maybe if I bribe my husband with this, he will watch Star Trek with me! It's worth a shot :) And if it doesn't work, at least I have a vegan feast to pig out on.